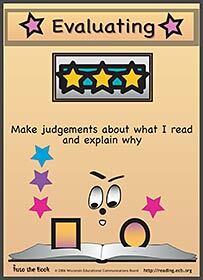 Readers judge, justify, and/or defend understandings to determine importance based on stated criteria. Make judgments about what I read and explain why. Students learn to critically evaluate websites while racing to build and launch a rocket during this activity. 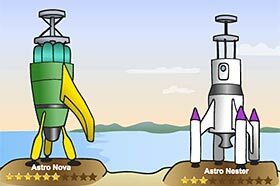 To build each stage of their rocket, they must choose which website would be the most useful source for a particular research task. The program guides students to apply specific criteria to the task, evaluating for appropriate information, reliability, and currency. In this activity, students voyage to the star system Magla. 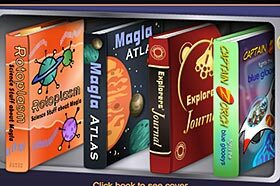 They have four books in their space ship, which they use to help them evaluate the three planets in the star system and decide on which to land for each part of their mission. They must also evaluate the books based on their usefulness for each task. In this episode, Mrs. Pingel introduces evaluating using class book reviews and examples from students' own lives. Malaika begins evaluating the books, Web sites and other resources she has gathered for her topic. She is drawn into a NASA web site, where she has to use the strategy to get out of a space emergency in her own rocket ship. She also manages to use the strategy to get a new dog from the Humane Society.